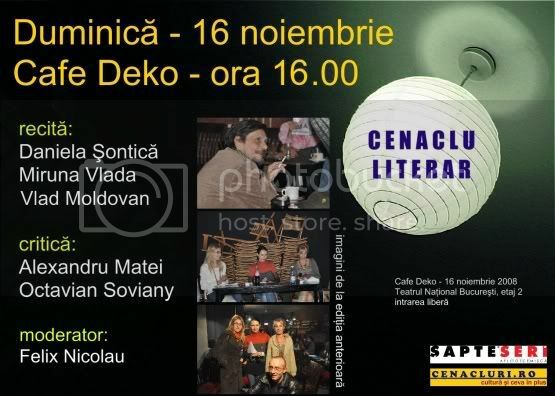 Café Deko became since November 9, 2008 a space for debates and literary meetings with writers and recognized critics. You’ll be able to read really soon in a separate material a chronicle to the first edition of literary circle. “The literary circle at Deko” proposes itself to bring in the foreground of the public life the writers that debuted in volumes, writers that have confirmed before, but also to discover and to encourage spokesmen of new literary values. The invited writers to the second edition will be Daniela Şonticã, Miruna Vlada and Vlad Moldovan. The critics: Octavian Soviany and the young critic and essay writer Alexandru Matei, which participated also at the first edition, will honour us again with their presence at this second edition, being invited to give a hue and to urge the spirits of the participants. The discussions are opened and will be moderated by the writer and critic Felix Nicolau. Until the date of the meeting we hope to be able to announce here some more important surprises. The literary circle at Deko is an interactive meeting, with the purpose to transmit live as soon as possible, and to become a cultural archive of reference. Images from the first edition can be found at the Deko literary circle photo archive. The entrance is free for all literature and constructive literary critic lovers. Those that want to read for the public in the official frame of the literary circle in a prospective edition, under the sights and the amount of critiques, are asked to send us by email at cenaclu@agonia.net few samples from their own materials, the providing of materials being recommended especially in the case when the authors are not presented on www.agonia.ro.